Everyone, without exception, is God-governed. We all have harmonious biological systems which carry us around from place to place. We all have language for communication. We act in harmony in so many ways. There are buildings, institutions, transportation, orders of study, systems of business and education, which are all aimed at growth and improvement. Harmonious and loving relationships are the goal and achievement of many. Contributions through invention, imagination, arts, business, economics, engineering, agriculture all lift us higher in our expression. We all have so many gifts to share. We all compliment one another in how all our gifts fit together to form a society and culture. 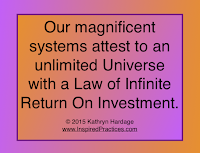 We individualize this Master-plan as we grow and define our own unlimited roles and help others to do so as well. Every idea which helps break through limitations is assured of success by the Law of Infinite Return. 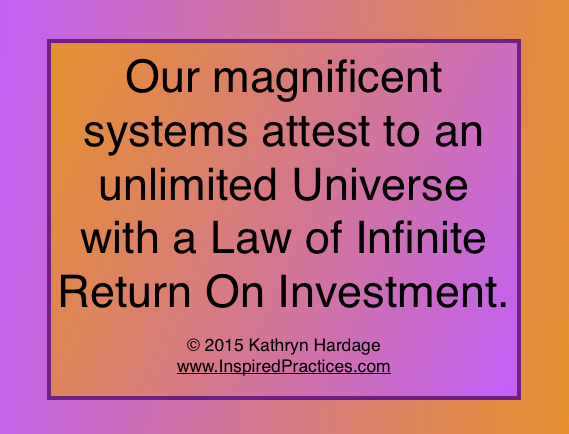 An Infinite ROI, Return On Investment. Living in an Infinite Universe, we are all able to bless each other in every way. We do not allow anyone to be left out. We are all so precious and loved, cherished and adored. This feeling within ourselves, communicates and joins together with others of like mind, and we achieve a harmonious neighborhood, country and planet.